On the inside, the International Space Station is about the size of a five-bedroom house. This image was taken on Feb. 10, 2010, during a NASA space shuttle mission. Two Russian cosmonauts will put on their spacesuits and float outside the International Space Station tomorrow morning (June 19) for a six-and-a-half-hour maintenance job. Flight engineers Alexander Skvortsov and Oleg Artemyev are scheduled to leave the Russian airlock for the vacuum of space at 9:50 a.m. EDT (1350 GMT). It will be the first spacewalk for both cosmonauts. You can watch the spacewalk live on SPACE.com, courtesy of NASA TV. The broadcast begins at 9:15 a.m. EDT (1315 GMT). Skvortsov and Artemyev are tasked with installing new communications equipment on Russia's Zvezda service module and repositioning hardware, according to NASA officials. The pair is slated to embark on another spacewalk in late August. 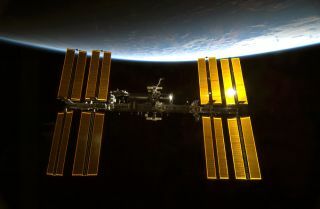 The $100 billion International Space Station was built by five space agencies representing 15 countries, with construction beginning in 1998. The lab has been continuously staffed with rotating crews of astronauts since 2000. Thursday's spacewalk will be the 180th in support of the station's assembly and maintenance, NASA officials said. Both Skvortsov and Artemyev arrived at the orbiting outpost on March 27 for a 5.5-month stint at the space station. They launched into space in a Russian Soyuz capsule along with NASA astronaut Steve Swanson. Those three spaceflyers are currently part of Expedition 40 with NASA astronaut Reid Wiseman, European Space Agency astronaut Alexander Gerst of Germany and cosmonaut Maxim Suraev, all of whom launched on May 28.